Dental implants are the absolutely best way to replace missing teeth. Dr. Nugent recommends dental implants as the treatment choice for all patients who have lost one or more teeth. Implants provide a more effective and long-term solution for replacing your missing teeth than alternatives such as dentures or dental bridges. When you are missing a tooth you are also missing the root that was in the jawbone. The tooth root is vital in supporting the jawbone and gum tissue. When the root is gone the jaw bone starts to fade away. Once bone is lost, is is extremely difficult to regain any bone. Dental implants are the ONLY tooth replacement options that also replaces the root and the ONLY tooth replacement option that stimulates and preserves bone levels. •Dental implants restore proper chewing function (eat the foods you love). •Dental implants look, feel, and function just like your natural teeth. •The slippage associated with old fashioned dentures is eliminated with dental implants. •Dental implants stimulate and preserve bone levels. Bridges do nothing to help bone levels and old fashioned dentures actually accelerate bone loss. •Dental implants are embedded into the jawbone, just like natural teeth. •Dental implants offer more comfort than removable dentures or dental bridges. •Bridges damage teeth. Dental implants do not hurt adjacent teeth. 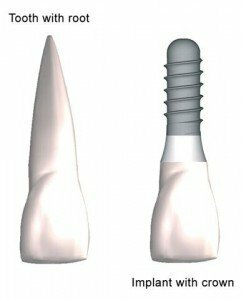 Implants preserve more natural tooth structure and improve long-term oral health. •Cleaning implants is very easy. Brush and floss them as if they were natural teeth. •Dental implants are the longest lasting tooth replacement option. •Dental implants are very cosmetic because they replicate a natural tooth from the root on up. •Dental implants will prevent the rest of your teeth from shifting. This eliminates many oral health issues that arise when your teeth shift. •Dental implants help preserve facial contours all while restoring your smile. 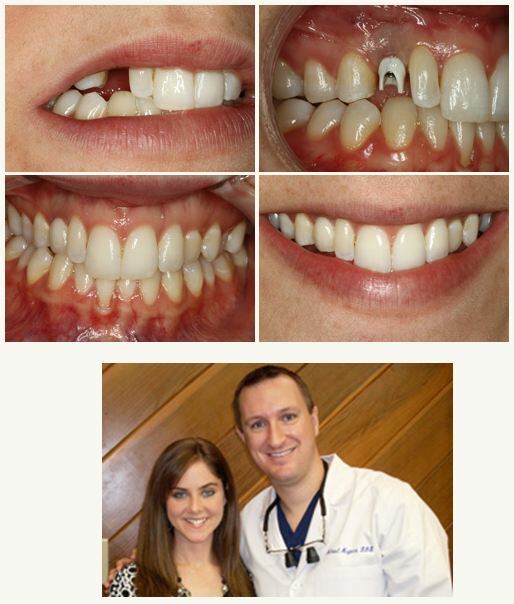 This patient was wearing a plastic denture to replace her missing tooth. She hated it and wanted a permanent and cosmetic solution. She looked online for an implant dentist and picked Dr. Nugent. 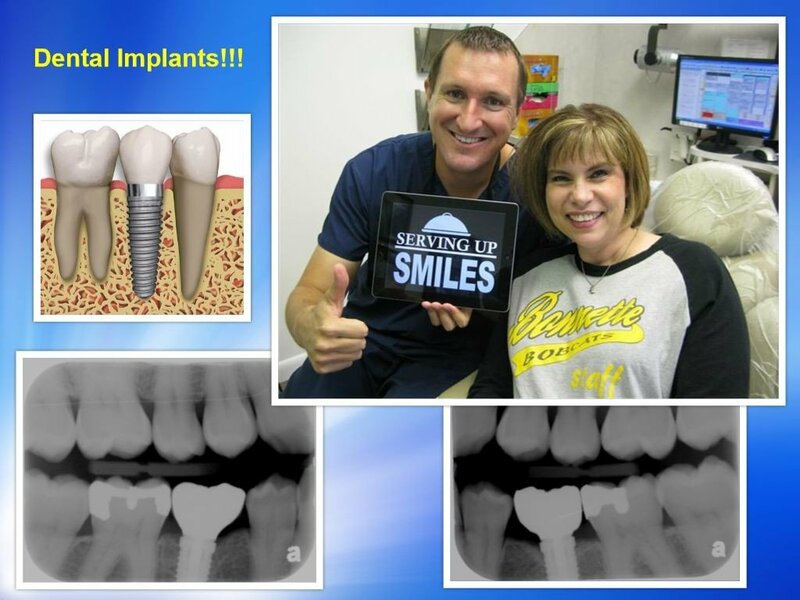 An implant was completed and the patient was super excited about the results! Dr. Nugent is a leader in Dental Implant Therapy. 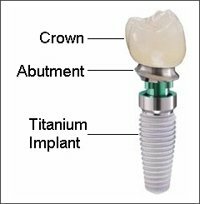 He has made implant dentistry a major focus at his Cosmetic Dental Practice. Dr. Nugent has helped patients from Pasadena, Deer Park, La Porte, Friendswood, League City, Seabrook and Houston Texas. Dr. Nugent has been voted best Pasadena Texas Dentist multiple times. See why patients and referring doctors love Dr. Nugent. Call our office to set up a new patient exam. Come see why Dr. Nugent has been voted best Pasadena Texas dentist multiple times. Visit us at 3421 Burke Rd, Pasadena Texas 77504 or call us 713-941-8261. Discover how dental implants can change your life and give you back your smile and dental health. The Importance of Routine Dental Visits.